Kids will love Root Veggies after this fun box! Contents include a "Root Veggie Ornaments" arts and crafts project, "Root Veggie Memory" game, two Root Veggie growing projects with organic non-gmo seeds and supplies, activity pages with crayons and stickers, a "Root Veggie Latkes" kid-friendly recipe + Root Veggie recipe guide, incentive sticker chart, a tips sheet to encourage your kids to eat Root Veggies from a pediatric dietitian, and an "I Eat Root Veggies!" collectible button. 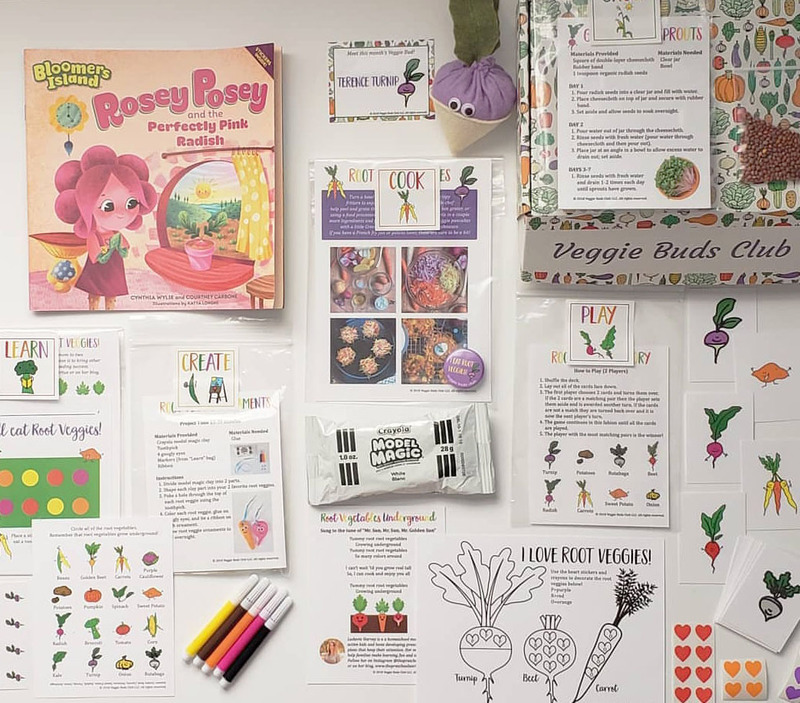 Since this is a super club box you also receive a book, "Rosey Posey and the Perfectly Pink Radish" by Cynthia Wylie, and an adorable felt veggie turnip!